Warp Rings live wallpaper has a bit of a 1960's vibe to it. 2 sets of concentric rings move around the screen overlapping, stretching and warping. Very trippy fx. ★ Cool colorful stretching and warping rings creating vibrant optical illusions. Configure and control every aspect of this vibrant, colorful warp ring effect. Two sets of concentric rings overlap, spin, warp and fly around the screen creating a trippy variety of visual effects on this live wallpaper. This effect is inspired by old school projector effects from the 1960's rock concert scene. Efficient rendering is only active when the effect is visible in order to consume less battery. 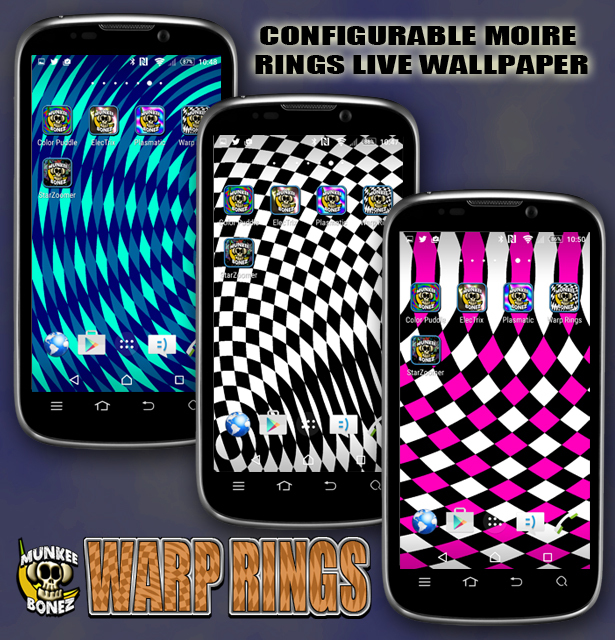 The free version of Warp Rings Live Wallpaper allows you to modify multiple settings for the effect, offering outstanding visual variety. ★ Effect Resolution, to allow for smooth frame rates on older devices/lower CPU usage. ★ Color of each ring set and the background from the full RGB spectrum. ★ Black and white mode for that old school 1960's look and feel. ★ Rotation, variable speed spinning of the effect. ★ Magnification, control the size of the rings independently from 1x - 6x magnification. ★ Horizontal density, to control the repetition of the rings horizontally. ★ Vertical density, to control the repetition of the rings vertically. ★ Control for each ring set's horizontal and vertical travel distance and speed. Hope you like what you see, I'd love to hear what you think! S-health and more so NikeRunning have sucked, what's going on? Recommendations for other apps? Why is the Facebook app on my ASUS Android Tablet hanging on startup? Is there an app that allows me to draw on my S6? Searching for an Android photo app with a food enhancer. Can anyone make a recommendation? How do I delete a virus on my system/app folder?